It should be a simple matter: building a new sea wall for Rye Town Park, in the wake of Superstorm Sandy, which left a gaping hole in the old one. 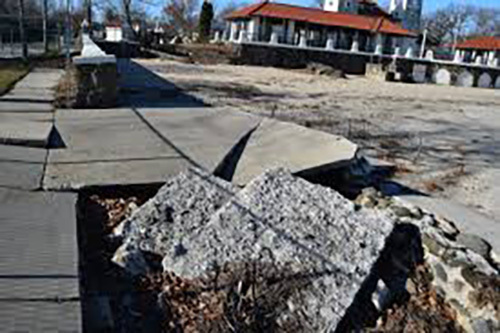 But today, more than six years after the Long Island Sound rolled up Dearborn Avenue, leaving behind buckled pavement and debris, the gap in the sea wall remains. If all goes well, that may soon change, says Rye Town Supervisor Gary Zuckerman, who heads the Rye Town Park Commission (RTPC). ?It?s possible that repairs could begin as soon as February.? Why has it taken so long? It turns out that the gap in the sea wall serves as a window into the complexity of contemporary American government. Rebuilding that wall has involved, depending on how one counts, no fewer than four federal agencies, three state agencies, and three local bodies. Add to that sheer bureaucratic complexity inter-jurisdictional conflicts between the City and Town of Rye, which both have representatives on the Commission, which is responsible for the park and the beach, where swimmers and sunbathers have had to endure a hazardous eyesore for the last six summers. Also involved are environmental, engineering, and grants management consultants. At the root of it all is the fact that the Commission, from the start, has looked to the Federal Emergency Management Agency (FEMA) as a source of post-hurricane disaster relief monies to pay for replacing the damaged, 100-year-old wall. Engineers estimate that it will cost some $1.3 million ? viewed as a substantial amount by the Park Commission, whose entire annual budget is $3 million, as well as by the City of Rye, which has its own major capital repair needs. The two jurisdictions, by statute, must share the repair costs, with the Town of Rye paying 60 percent and the City paying 40 percent not covered by Federal assistance. That 90 percent which FEMA promises does not come easily, however. It requires approvals from other agencies ? lots of them. Those who must sign off include the Army Corps of Engineers, which, in order to grant its ?nationwide permit 13? must be satisfied that ?no material is placed in excess of the minimum needed for erosion protection? and that ?the activity will not exceed an average of one cubic yard per running foot, as measured along the length of the treated bank, below the plane of the ordinary high water mark or the high tide line.? The US Fish and Wildlife Service must be satisfied that the rebuilding process will not threaten endangered species; the National Oceanographic and Atmospheric Administration must be certain that no ?essential fish habitat? is damaged. All those federal permits are prerequisite for the thumbs up from the state Department of Environmental Conservation, which must grant its tidal wetland permit. All this might have gone relatively more quickly had it not been for disagreement between the City of Rye and Rye Town, which includes Rye Neck, Port Chester, and Rye Brook. Not surprisingly, money was involved. That?s because the sea wall itself is actually two walls ? one facing the beach, owned by the Town and managed by the Park Commission, and one facing the Sound and owned by the City. At first, the City had agreed to be the so-called ?lead agency? applicant for hurricane relief funds, but, by 2016, had chosen, instead, simply to repair its portion of the wall and pay for doing so itself. It apparently did not take pains to tell the Town that it had to step into the breach. That almost sank the remainder of the rebuilding entirely; at one point, FEMA?with which the Town of Rye communicates only through the New York State Department of Homeland Security ? told the Town that, absent a quickly-modified application, the sea wall project would ?go to the back of the line?.? That meant it would be of lower priority than any and all more recent hurricane relief operations such as that of Puerto Rico?s devastating Hurricane Maria. Today, the pieces seem finally to be falling in place. After clearing New York State?s Coastal Erosion Hazard Area regulations in early November, the project has received all the requisite state and federal approvals. So, too, have approvals come from the City of Rye Planning Commission, which had to issue a wetland permit under the terms of the Local Waterfront Revitalization Program. More recently, the project was approved by the City of Rye Board of Architectural Review ? necessary because the site itself is geographically within the City, notwithstanding the fact that it falls under the Park Commission?s jurisdiction ?and because it?s listed on the National Register of Historic Places. Supervisor Zuckerman?s chief of staff, Deborah Reisner, expressed the hope this week that a request for bids to do the actual construction will go out shortly. Still, obstacles remain. The City of Rye Building Department must issue a permit for ?sidewalk supports? that would be part of the foundation of the new wall; because the City owns the adjoining sidewalk, such a permit ? and ultimately a City Council vote approving it ?is required. Then, notes Deborah Reisner, ?timing is critical?. If construction is not completed by early spring, the project may run afoul of its Department of Environmental Conservation permit, which is contingent on no endangered species being affected. Common terns, which nest in beaches in the Northeast, lay their eggs in May. Construction delay could set the project back yet another year. Asked if the entire process has left him frustrated, Gary Zuckerman responded, ?I?m not frustrated, I?m determined. ?